Review by Roy Sugarman, Ph.D. This little book will warm your heart, especially if its 6.5 by 4 inch bulk slides easily into your shirt pocket, as it does in mine, nestling over my heart and protecting me from bullets, both chemical and real. The book begins with a description of the general principles of prescribing, taking a quick look at initial evaluations, then target symptoms, and the use of polypharmacy. Drug interactions are covered, and specifically the issues of cytochrome enzyme interactions, protein binding, absorption and excretion, and other pharmacodynamic interactions are discussed. All of this takes just 9 Mini-me pages, so you can understand how tight the writing it, with drugs grouped on pages 6 and 7 in tables that make it easy to see what will talk to what. 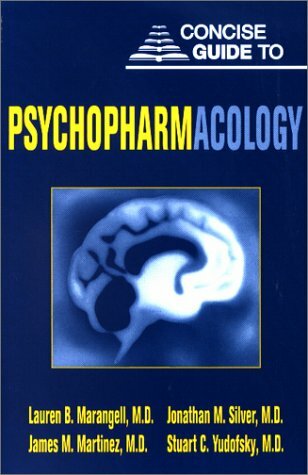 Part two goes straight into antidepressants, looking at both tricyclics, heterocyclics and newer medication overall from the point of view of mechanisms of action, indications and efficacy and clinical use, as well as risks, side effects, and their management, all of this in 10 pages, again with handy reference tables taking up four of these pages. Newer drugs such as escitalopram, buproprion and mirtazapine all get mentions among others, and even a short paragraph on Borderline Personalities here, but nothing of reboxetine for instance, which I presume the Americans don't have yet. Anxiolytics, hypnotics and sedatives all get similar terse treatment, looking of course at the benzodiazepines to start with, via the routes of mechanisms of action, indications and efficacy, selection, risks, side effects and management, dependence, withdrawal and rebound effects, memory impairment, and disinhibition and dyscontrol (all in the first 4 mini pages: good writing), and again with omissions, namely zopiclone for instance, again I guess not in the US market, but buspirone does appear. Antipsychotics show up next on page 83, with pretty much the same headings as before, except of course the paragraphs and headings related to harmful effects are much more numerous and lengthy. Again, as before, there are omissions like sulpiride and amisulpride, its new cousin, which have been around in Europe and African for decades in one form or the other, and are unusual compounds, used to induce breastfeeding, as anxiolytics, and as of course major antipsychotics if given in sufficient dose, with the capacity to sort of be atypical, or at least 'go atypical' on us with pre and post synaptic actions depending on the dose. Risperidone is mentioned, but not the newer long-acting injectable Contra, which may only recently have hit most markets; however, no mention is made of this relative cheap drug's potential to 'go typical' at higher doses, and this must rank as an omission. Mood stabilizers have their time in the sun by page 123. Noticeably sort of absent apart from passing references are topiramate, gabapentin and others, presumably again because a book published in 2002 may have been collated over a period of years, and thus come to press before most of the drugs are well know, but many books I have from that date include extensive work on such drugs, so it seems remiss to exclude them. Likewise, and again probably because of the date of publication, the pages on Bipolar Affective Disorder are weak, and the role of lamotrigine in the depressed phase is for instance not there at all, nor are the recent updates from various authors in 2002. The stimulants and cholinesterase inhibitors all get a look in, and if fact 29 pages covers this, or just over 10% of the book. A useful index fills the balance of the book, and a glossary of the generic names of common American drugs is also there. It's a nice reference though, pity about the dating and the Americo-centric writing, but that is the market for this book. My own psychiatric registrars would find this book useful in the beginning, but discard it later in their studies, as it is a little dated, but also, in the sacrifices of heuristics, it has lost a lot of more extensive and obscure detail, and is more of value to the medical officer rather than the training specialist psychiatrist. However it does fit nicely in the pocket, and thus has its availability heuristic philosophy prominent in its marketing from its Texan and Yankee compilers. Roy Sugarman, PhD, is post of Clinical Director of the Clinical Therapies Programme in Liverpool (Sydney) and Clinical Associate Professor at the University of New South Wales.